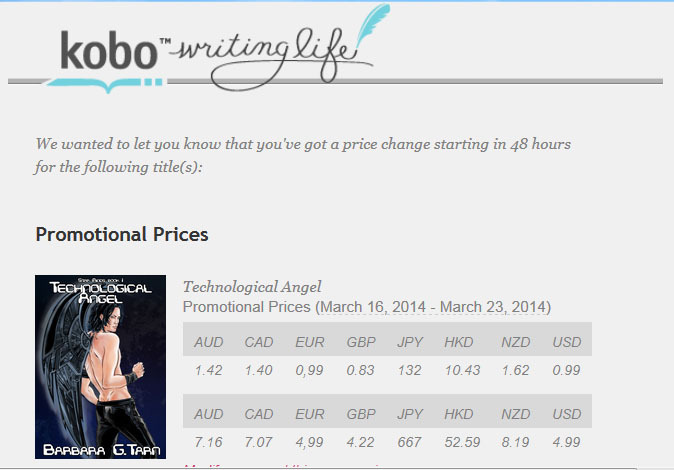 To celebrate the brand new cover by Cristina Fabris, Technological Angel will be at 99cents ONLY on Amazon, Kobo and DriveThruFiction and ONLY from today and until March 23! See the neat little email KWL sent me when I experimented with their brand new button “Set Promo Price”? Sorry for all those other currencies, the 99cents is valid only for US$ and euro on Kobo (link to Kobo US). As for Amazon, I set the price to match the US$ amount, sorry (link to Amazon.com). It should be lower on the other Amazon shops as well, but not as neat as Kobo. Check also their Sales Guide for more special offers – DriveThru specializes in SFF, comics and Games, so if that’s your cup of tea, go and check them!